The Bunker is a truely unique and special environment for heart-pounding and intense paintball games. Our indoor game map is set within a genuine World War II RAF Bunker with tunnels, rooms, corridors, stairs, multiple levels, balconies, and surprises around every corner. Our outdoor maps are also specially designed to ensure a highly memorable paintball experience that is not for the faint hearted. Our low prices are matched by second-to-none facilities and dedicated, motivated staff who will ensure your visit to us is both safe and a huge amount of fun. We have almost 20 years of experience delivering top-quality paintball games and use only the best equipment available. 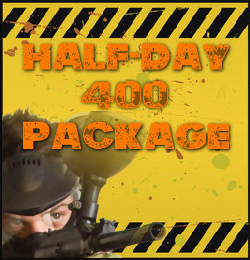 Basically, you wont find a better paintballing experience in Devon. Players need to be age 12 or over and the venue is available for morning, afternoon and evening games with floodlighting, indoor and outdoor environments, smoke machines and sound effects/music. 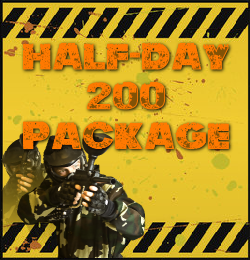 Bunker PaintBall is available for bookings 7 days a week for morning or afternoon sessions. Morning games start at 9am and finish around 12:30pm. Afternoon games start at 12:30pm and finish around 4:30pm. Pre-booking is essential! We are also available by special arrangement for evening games (please contact us to discuss). 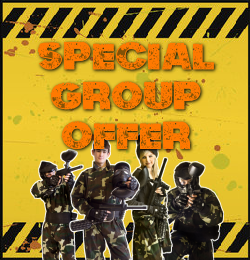 All evening games are subject to a surcharge of £10 (per 8 people in your group) due to extra staff costs.